I’m introducing a review with an apology. I think that’s breaking one of the cardinal rules of writing. But I also remember my eighth grade English teacher telling me that I could break grammar rules once I was a published author. Which I am, several times over. So does that mean I can break the rules now? There are times when I realize that I’m not very good at this job. See, I forgot to write down the gentleman above’s name. He’s a great guy, a rep for a Virginia beer distributor who came down to Bruno’s GastroPub at Smith Mountain Lake in lieu of the Blue Mountain brewers who were desperately trying to save operations post-derecho. A great guy, but a guy whose name I can’t remember. And I didn’t write it down. Fail. I also failed to take a picture of the owners of Bruno’s, Bruno & Tiffany, which I fully intended to do from the get-go, but ended up getting a little tipsy on not enough pre-beverage food and high gravity beers. Again, fail. But a delicious fail, I suppose. Just two days after that crazy derecho swept through Virginia (we spent a bit of time in the basement with the cat, who, unsurprisingly, wasn’t thrilled with the idea of being in a crate), G & I headed up to Bruno’s GastroPub to attend their fabulously named “Sunday School.” The purpose of Sunday School? To learn, in-depth, about a particular craft brewery and enjoy several food pairings from Bruno, the executive chef of the pub, the restaurant (The Landing), and the Bruno’s GastroTruck (which I reviewed back in March–definitely need to revisit soon). (So why wasn’t my Sunday School back in the day like this, I ask you?) It felt a little rich to go to such an event when three-quarters of Roanoke was out of power, but the lure of beer and food is always strong and it seemed like a great way to pre-game our Fourth of July vacation. 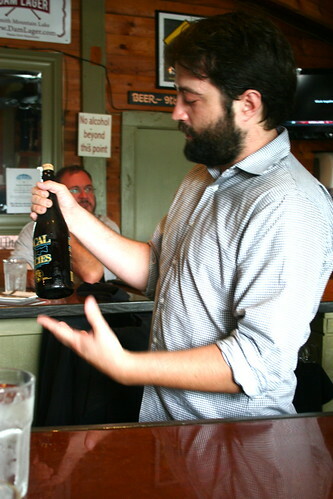 This Sunday School was particularly special—it featured Blue Mountain Brewery’s new organic barrel-aged collection. The barrel-aged collection was just introduced this year and features variations of Blue Mountain’s brews (as well as some new ones) that are aged in oak barrels and then bottled in 750mL bottles. The brewery built a separate building for the production and aging process and with bottles just now hitting distribution, it was exciting to get a taste of what’s in store for Virginia craft beer. 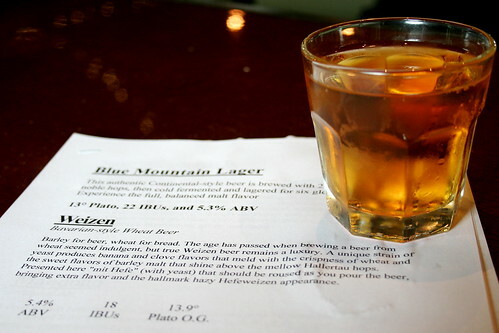 After settling in with twenty or so other people, we started with a tasting of Blue Mountain’s cornerstone beer, the Blue Mountain Lager. While I’m not the biggest lager fan, this one is balanced nicely between malts and hops and is a great “standard beer.” At only 5.3% ABV, you could sip a few of these during a ball game or a marathon afternoon of grilling. 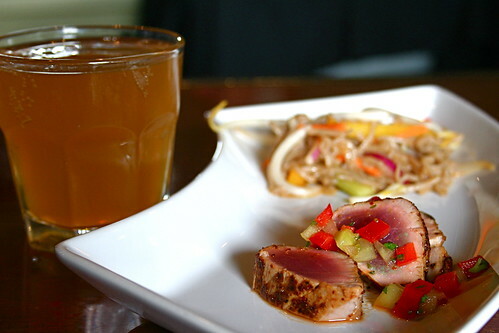 Next up was the Weizen (5.4% ABV), a Bavarian-style wheat beer, paired with a Deconstructed Tuna Salad. The wheat beer was light and fruity from the Belgian yeast strain and paired nicely with the tuna salad which packed a bit of a kick from the spice rub. The tuna was served in the tataki style, but was rubbed with chilis and other spices in a Latin American twist (I believe) instead of crusted with pounded garlic. A red pepper and onion relish was served on top and alongside the tuna was a buckwheat soba “slaw” of noodles and vegetables. It was a quintessential summer pairing and a great way to start the meal—a bit of spice, some cool noodles, and a refreshing wheat beer. 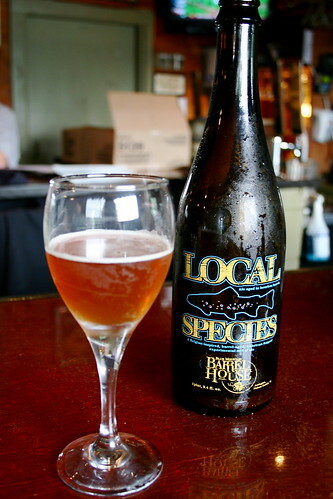 After the Weizen, we were finally given a chance to try a barrel-aged beer: Local Species (6.6% ABV). Blue Mountain billed Local Species as “Belgian-inspired, American-hopped, barrel-aged pale ale” and it lived up to the expectations. An ale marrying barley malts, American hops, and Belgian yeast, then aged in charred American White Oak, is quite a mouthful, but I found a rich, smooth, autumnal beer that I want to drink like wine. A perfect dinner beer, or one to sip slowly with friends next to a fire. And, on another note, isn’t that bottle design fantastic? We bought a bottle to take home with us and I can guarantee I’m saving that one for use as something else, even just a candle holder. 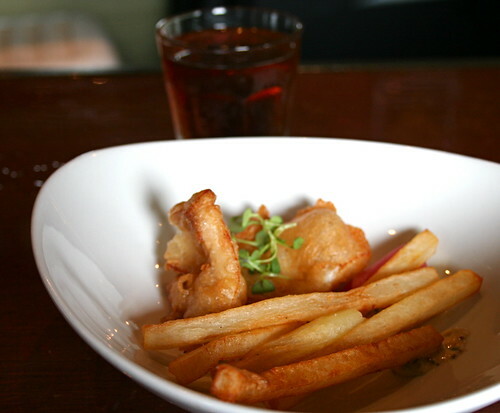 Next was the Steel Wheels ESB (6.5%) paired with Bruno’s take on Fish & Chips. The ESB (named after the band The Steel Wheels, based out of Staunton, Virginia) was a nice, clean malt that paired British crystal malts, Scottish yeast, and American hops. G & I were both pleasantly surprised by this one—I’ve never really loved an ESB before, but this one was so fresh and different, not too malty and definitely not hoppy, I fell in love. As for the fish & chips? We were not given a big enough portion. Seriously. I need a double-size basket of those fish filets. Fried to crispy perfection in a batter made of the Steel Wheels ESB, the fish was flaky and zipped with the tang of pickled onions and an in-house remoulade (the whole grain mustard really made it sing). This was drinking food at its finest—a dish my sober friends would adore just as much as I did sipping it with the ESB. The Mandolin followed on the heels of the ESB. A sister beer to Steel Wheels, it’s the same beverage aged in oak that resulted in a more mellow, velvety malt than the Steel Wheels. Again, more of a sipping beer and without the clean edge of the ESB, but a beer that holds up beautifully on its own. Something about the barrels turns the brews into pure autumn, amazing how the wood draws it out. 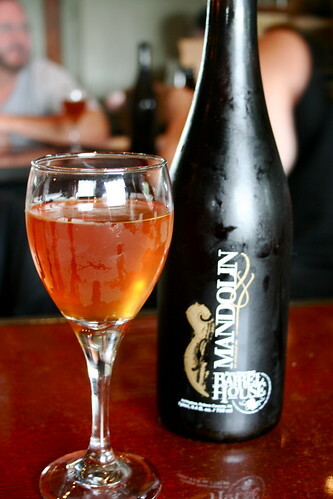 After Mandolin came Isabel (6% ABV)—a Chocolate Orange Bourbon Porter that blew my mind. If you like clean, simple, or hoppy beers, this is not the beverage for you. But if you like multiple flavors, smells, and experiences in one glass, indulge. As soon as you can. Somehow not a stout (we were told it’s all arbitrary), this dark, stouty porter smelled like dark chocolate and tasted like a rich milk stout cut with orange. Exactly, figure that one out. 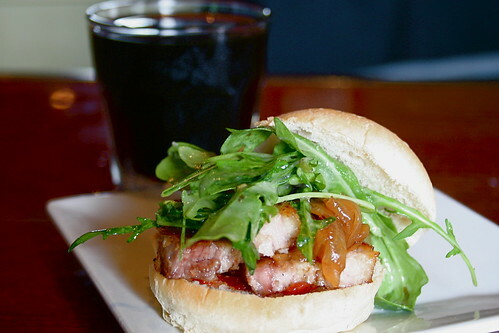 It sounds like it shouldn’t work, but it does, and it tasted great with the fatty rich Berkshire Pork Belly Slider. Braised in the porter, the pork belly was seared and then served with a generous heap of arugula, caramelized onions, and a sauce which, at this point in the meal, I couldn’t figure…something tomato-based (really, by this point you shouldn’t trust my judgment, I was half-way drunk and in love with it all). While I wouldn’t have thought to pair a dark beer with pork belly, Bruno obviously new better, and this duo hit it out of the ball park. 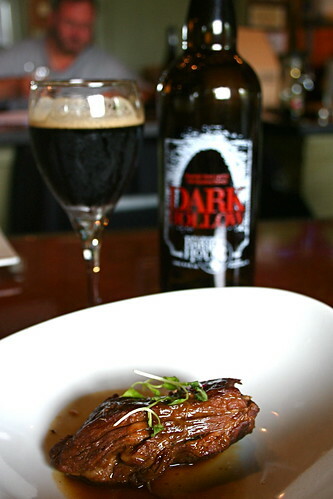 And, finally, our last pairing—Dark Hollow (10% ABV) with a Boneless Beef Short Rib. The short rib was braised in Dark Hollow, an imperial stout that is a sister beer of both Local Species and Isabel but aged in bourbon barrels. I found the beer to be an even creamier but less citrusy version of Isabel, which made it less and more complex at the same time. Less in that without the citrus, it was easier to taste the rich, cacao flavors, but more complex in the heavier quality of the aging. As for the short rib, it was falling-off-the-bone good (if there were a bone, but you get my drift). Rich and heavy for summer, it worked well with the stout, and, again (I’m sounding like a broken record) would be fantastic in autumn or winter. A slow cooked meal to be enjoyed best with a slow sipped beer. G & I then shared two more beers and then, after sobering a bit, drove back home in the sticky hot 100+ degree heat fully sated and thrilled about the new Blue Mountain barrel-aged offerings. Full disclosure: I was invited to attend the event by Bruno & Tiffany & the folks at Polished Pig. I wasn’t asked to write a review or say anything favorable, however, and all of the above is my own thoughts and impressions of the event. I can honestly say that we’ll be back for another Sunday School and hopefully one of the cooking classes Tiffany holds in the fall. The event was organized great—service ran smoothly, a large group was able to sit together towards the back of the pub, the food was always hot when it arrived—and we, and everyone else in the pub, felt extremely welcomed and at home. (Plus, the price is a killer deal–only $25/person.) Bruno & Tiffany have a wonderful series with these Sunday Schools and I hope more people from Roanoke and the surrounding areas get over to Smith Mountain Lake to enjoy them! ESB!I love EBSs but can never really find them in our local stores. I guess I need to go into SF…or, you know, to VA.
What a great way to spend a Sunday. I know a few people up here in Northern VA who would love to road trip for this. Haha…that is definitely a different kind of Sunday School than what I grew up with. It really does sound like you get a lot for just $25. By the way, I’ve just gotta say…the unnamed beer rep at the top is really cute. Everything looks great, awesome presentations! This all looks so good! I am so excited for the first official Virginia Craft Beer Month in August!